Here are some exercises meant to interest the “non-readers.” These are gleaned from MONSTERVILLE, as my main character, Lissa Black, is fascinated by the world of film and sees her world through the lens of a camera. To her, each component of every day is a movie scene and a chance to be creative, even though she’s not really a reader. She’s more visual. Have kids read a book that has been made into a movie. It can be anything. Don’t make them answer any specific questions about the book. Instead, have them do a report about why they preferred one over the other, with examples (maybe the book was better in the sense that the movie didn’t do justice to one particular character, and maybe the movie was better because it cut a plot line that bogged down the main story). This exercise will give kids a sense of how a work is structured to be engaging and have emotional impact, and they’ll learn about what works to that end and what doesn’t. Have kids take an ordinary conversation they’ve participated in or witnessed and turn it into a dialogue or a scene. (I do this in MONSTERVILLE- Lissa’s friend’s brother Scott is obsessed with Call of Duty, and that’s how Lissa gets the idea for the play she writes. It’s an exaggerated, funny version of how she perceives Scott). This will show kids how they can make ordinary scenes funny or interesting, which helps in writing stories (and makes the process more fun). Have kids watch a movie and write down how it follows the beats to Blake Snyder’s SAVE THE CAT. (I can’t stress enough what a wonderful – and fun – writing tool that is for young writers). Here is a table I’ve compiled, which lists the sixteen beats and has a space where the student can fill in where it happens in a movie. This is fun because kids will realize that no matter the type of movie (action, comedy, drama), it follows the same structure. Books have a similar structure, too – I now use SAVE THE CAT for all my projects! For a writing project, require the outline to have more pictures than words. This will force kids to really visualize how their story will play out, as well as prevent them from getting bogged down in too much detail. Want an example? 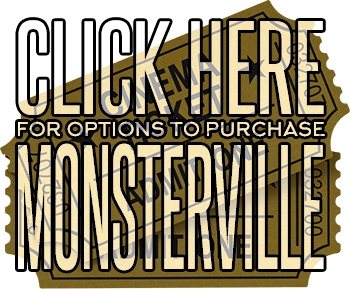 Here’s what I used to write MONSTERVILLE! (This is the board game the kids use to navigate the world of Down Below once Lissa’s sister is taken). What kind of movie (live action, animation, stop motion) would it be, and why? Who would be cast to play the major and supporting characters? What revisions would be needed to make the book work onscreen? Not every kid wants to spend their weekend reading books. Sometimes, there needs to be a hook, or maybe something visual to engage the non-reader. Movies – and the process of film-making – can be that tool. If you think outside the box, students will, too! *Visit Sarah S. Reida’s website (which includes movie trivia, tips and resources for teachers, and film-making information) at: http://www.lissablackproductions.com. Her debut middle grade book, MONSTERVILLE: A LISSA BLACK PRODUCTION, can be found on both Amazon.com and BarnesAndNoble.com.